By Words by Paul Strachan Photographs at Dean & Deluca, used by kind permission of F&M Media Solutions Co., Ltd. I remember the first time I met Tracy Cosgrove. It was at the Hard Rock Hotel here in Pattaya about four years ago. The previous month there had been a charity dinner which raised money for the Fountain of Life and the Melissa Cosgrove Foundation. Four weeks later the cheques were being presented to the Fountain of Life and to Tracy Cosgrove (who really is the Melissa Cosgrove Foundation) so I was on hand to do an interview with the beneficiaries. Tracy was at first reticent to do an interview with me, saying she wasn’t used to being interviewed and she threatened to push me into the pool of the Hard Rock if I messed it up. 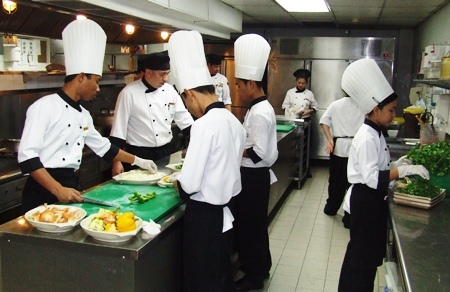 Four teenagers from one of Tracy’s projects are taken in by Marriott Resort & Spa (Bangkok) Executive Chef Jai Krishnan Govindan, who for the last 3 months has been giving them a basic grounding in working in the kitchens of a world class hotel. However, I managed to get through the interview without getting soaked and this marked the beginning of a friendship that has flourished over the years. Little did I know at the time that Tracy had previously been voted Scotswoman of the Year (not bad for someone who was born in Manchester) for her charitable work in Scotland and since then her commitment to worthy causes has increased with her work changing the lives of so many people here in Pattaya, Bangkok and even Myanmar. Tracy’s nurseries at worker camps have almost become the hub of each camp, with mothers coming in with their babies. I came to live in Thailand just after the 2004 Boxing Day Tsunami; in its aftermath Tracy organized and donated over £1,000,000 worth of brand new goods to the Thai Social Welfare Director General including donations of clothing from Harrods and Yoko One Designer wear. My friendship with Tracy has given me a real insight into the work that she does and the many challenges she faces. Paula Taylor beams her beautiful smile during an interview with Paul Strachan for Pattaya Mail TV. Her ability to converse with high ranking businessmen, people in show business right down to the kids she looks after is a testament to her infectious need to help others. She is a no-nonsense woman, with a direct approach to getting things done. For instance, when she needs an air-con for a project she doesn’t go to the local shop, she calls the manufacturer directly and gets it donated to her free of charge; no 20-30% discounts, Tracy demands full cooperation and invariably she gets it with a warm smile. The wonderfully bright red Santa, booming voice and all, takes time out from handing out candies and lollies to some of Tracy’s ‘kids’ to pose with a happy crew made up of some of the benefactors, organizers and friends. Over the years she has garnered a host of contacts who are proud to be part of her success story. In fact, Tracy wouldn’t have achieved nearly as much if it wasn’t for the support of others, whether its people donating to costs, use of cars, paying staff wages, someone simply paying for ice-cream for the kids and of course hotels such as the Marriott Resort & Spa and the Rembrandt who give her free accommodation so that she can get about the business that she does best. Recently I have been seeing a lot more of Tracy because of her connection to the Lighthouse Club in Pattaya, which we cover every month for PMTV, so when she asked me to see some of her projects in Bangkok, I jumped at the chance. Our first stop was the Marriott Resort & Spa (Bangkok) where I was introduced to Executive Chef Jai Krishnan Govindan, who for the last 3 months has been supporting Tracy by taking four teenagers from one of her projects and giving them a basic grounding in working in the kitchens of a world class hotel. These kids (sic) came with no skills whatsoever but quickly became accepted as part of the team. They were given the same ‘whites’ as the other staff and work a full working day, so that they learn not only the job, but also the importance of commitment and respect the work ethic. In their time at the Marriott they have been instructed in hygiene, using the correct equipment for the varying tasks, and time management. This was a new approach to charity, a way of instilling skills into the next generation so that they can carve a better life for themselves and become a part of a highly skilled workforce in an ever increasing business. From then we went on to one of Tracy’s nurseries. For me this was covering old ground, but for those who don’t know, this is one of the main areas of concern that Tracy has. It started years ago when she was driving behind a truck that was filled with workers who had just finished their shift at a local building site. Tracy, being the curious person that she is, simply followed the truck to find out where these people were living. Upon arrival at the workers’ camp, Tracy was disturbed to find that their living conditions resembled a concentration camp, with families of four living in six by six meter wooden huts with corrugated tins roofs. In addition to this, basic hygiene was lacking and the children had nowhere safe to play, as open sewers were sprinkled around the camp. Tracy approached the owner of the camp and explained that she would like to build a nursery/kindergarten which would give the kids somewhere safe and clean to play. After initial reservations about the pushy English woman, the boss of the camp saw that it was a great idea and he gave the go ahead. Tracy set about getting all the elements together, from flooring to roofing, air-con, toys and of course carers. Needless to say, this was a huge success and one that re-invented how these camps operated. Indeed, fast forward to today and Tracy explained to me that now the bosses allocate the nursery as a priority – in fact it is almost the hub of the camp, with mothers coming in with their babies out of the overbearing heat and dark recesses of their makeshift homes. On the day, Tracy introduced me to a young girl who had actually been in three of Tracy’s nurseries, since, as one job gets completed, the family moves onto another camp and if they are lucky it will be one where Tracy has worked her magic. From there Tracy and I (along with Tracy’s daughter Melissa and my cameraman) hot-footed it across town to the new trendy Dean & Deluca eatery and coffee shop. It is a sleek designer type venue already famous for its coffee, sandwiches and bagels and is superbly managed by John Barton and his highly trained team, who were chilling the sparkling champagne and preparing the appetizers and mince pies. But we weren’t there to eat: a special night had been organized and it was time to get into the spirit of giving and indeed Christmas. After I returned from a quick dress change into something more appropriate, the room rapidly started to fill at the early hour of 6 p.m. The chairs and tables had been removed from the restaurant to accommodate the guests and the enormous Christmas tree. Tracy introduced me to two charming ladies, Jill Chanapai and Linda Kei Kubota, who make children’s quilts using their own funds and spare time, adding another small cog to Tracy’s overall plan. I had heard that the Thai superstar Paula Taylor was likely to attend, and as the perfectly attired ladies entered I was sure one of them was Paula. However, this was merely the class of people who were giving up their time to support Tracy. Also, some ladies from Pattaya, including PILC president Bea Grunwell and the ever smiling Eva Johnson made the effort to attend. As I was looking for Paula a loud voice boomed across the room, that of a wonderfully bright red Santa. He played the part perfectly and his timing coincided with the arrival of some of Tracy’s ‘kids’. Santa handed out candies and lollies to the children, grabbing their undivided attention. Just then a tall elegant beauty entered the room; actually she almost commanded the room. In a red dress and heels, Paula Taylor was even more beautiful than her photographs and after a few moments I was told that she had agreed to do an interview for Pattaya Mail Television. I gulped down my wine and thought, my goodness what shall I ask her. As I was frantically trying to gather my thoughts and sober up, she was presented in front of me. The cameraman floods us with light, thrusts a mic in my hand and gives me the signal that we are rolling. Paula is an old hand at being interviewed and straight away it was like we were old pals just having a chat. She spoke about her upcoming wedding and I asked her why was she was supporting the Melissa Cosgrove Foundation. She replied that she had read an article about the work that Tracy does and what impressed her most was that Tracy was not Thai but was giving so much to help Thai children. This was something Paula had not experienced before and it touched her immensely. After the interview, as well as bringing a bit of razzmatazz to the evening, Paula had the honour of switching on the Christmas tree lights. Many of the guests brought presents which were put in a gigantic box, and the hope is that more presents will be donated in the weeks up until Christmas. Tracy told me that people in Pattaya can also give gifts for her ‘children’ by dropping them off at the Northern Thai Real Estate office. The evening at Dean & Deluca was the perfect end to a wonderful day with Tracy, with children singing, a brass band, Santa and a few mince pies washed down with a glass or two of wine. I feel proud to know Tracy and play a small part in highlighting her work to the public. Our next day out is likely to be a few days excursion to Myanmar. If you would like to get involved in the Melissa Cosgrove Foundation or sign up for the next charity tandem skydive planned for the end of January please go online to www.mccf.uk.com or call Tracy direct on 0847785476.